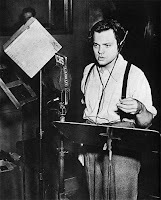 ANNOUNCER: The Columbia Broadcasting System and its affiliated stations present Orson Welles and the Mercury Theatre on the Air! ORSON WELLES: We know now that in the early years of the twenty-first century this country was being watched closely by beings different than normal man and yet as mortal as he. We know now that as human beings busied themselves about their various concerns they were scrutinized and studied, perhaps almost as narrowly as a man with a microscope might scrutinize the transient creatures that swarm and multiply in a drop of water. With infinite complacence people went to and fro over the nation about their little affairs, serene in the assurance of their dominion over this small spinning fragment of solar driftwood which by chance or design man has inherited out of the dark mystery of Time and Space. Yet across an immense ethical gulf, minds that are as different from our minds as ours are to the beasts in the jungle, intellectuals, cool and unsympathetic, regarded this country with envious eyes and slowly and surely drew their plans against us. Obama Care may end up like the Martians...killed by the bugs. @zzyzx - or we'll be the ones killed by germs and crappy healthcare. Frankj was strangely absent for a while, then the obamacare website is all screwed up, then Frankj comes back and says he knows how to fix the website because he's awesome.